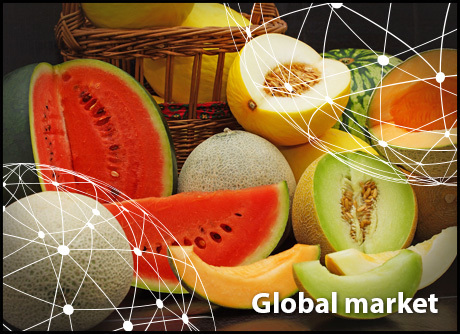 In the winter months, the demand for melons in North America and Europe is traditionally lower, since the winter weather keeps the demand in check. The mood on the market is determined by the supply from Latin America. The start of the rainy season in Brazil is raising concerns among Spanish importers. American importers are seeing prices drop as a result of the larger supply. The French prefer to wait for the local Charentais harvest. South African maize growers have been planting watermelons this season in hopes of earning money quickly. But is that possible? There are sufficient volumes of Honeydew, Cantaloupe and Galia melons available, says a trader. For the Galia and Cantaloupe, the market has recently switched from imports from Brazil to Honduras. Costa Rica is the most important watermelon supplier. Brazil supplies the Honeydew and Green Melons. The demand is slow, since the French mainly eat melons in the summer months. The French market is very sensitive to the climate. Melon consumption starts in March / April, when the temperature rises. Consumption is much lower outside the summer months. Moreover, the imported supply is not suited to meet the demand. French people mainly consume the melons they know. Charentais melons account for 80% of the consumption in the summer months. For growers in Latin America, it is difficult to grow and ship a comparable Charentais or Cantaloupe. The Piel de Sapo has the largest market share in Spain, both in terms of cultivation and consumption. This melon is also grown in Brazil in the autumn and winter. In the early spring, there are a few weeks with production in Senegal. At this time, Brazil is the one on the market, with a season that seems to be going a bit better than last year's. In total, however, Europe has imported fewer Piel de Sapo containers than last year. From January, sales fell as the demand fell due to the low temperatures. With the spring on the horizon, the market is picking up again, but due to the rainy season in Brazil, the supply is declining. Price-wise, March and April are interesting months, but Spanish importers are especially concerned about the rains, as their impact cannot be predicted. The prices for import melons from South America have been disappointing. The reason is simple: the supply of import melons has exceeded the demand. This is reported by a wholesaler at the wholesale market in Padua. "Prices are usually on the low side. For example, the average price for the Honeydew is 0.70 Euro/kg. The Cantaloupe is doing a little better, with a price oscillating between 0.80 and 0.90 Euro/kg. Pricewise, it has been a difficult year." This wholesaler keeps melons in the assortment all year round. Although the market is smaller in the winter months, there is enough demand from the retail and export. The melons are shipped to Italy from South and Central America. The yellow melons are imported from Honduras, Costa Rica and Panama. This melon is more attractive in southern Italy than in northern Italy. Cantaloupe melons are imported from Senegal, and Morocco will join in from March. Many consumers are waiting for the start of the Italian season. The first melons from Sicily are expected for late March, but everything depends on the weather. "December's planting is looking good, with a good setting," says a Sicilian grower. The largest fruit currently has the size of a ping pong ball. The melons are expected to be ripe by the first week of April, but there will be smaller volumes. For January's planting, it is still too early to make predictions. "We expect good volumes from May 5," says a grower. The Brazilian melons are usually replaced by the Costa Rican production. The Brazilian season has gone very well, with remarkably high prices for the Cantaloupe melons, even though these also dropped considerably at the end of the campaign. The Piel de Sapo melons had a good start, a lesser mid-season and a reasonable end. Costa Rica is currently shipping mini-watermelons and yellow, Galia, Cantaloupe and Piel de Sapo melons. In total, the melon supply from Costa Rica is up by about 15-20%. The weather during the fruit's growth and during the harvest has been excellent and the yields and quality are equally good. "On average, Central America started shipping watermelons three to four weeks earlier than usual. The volumes coming from Panama and Costa Rica are expected to increase and become more stable from late February. A lot of watermelons have been planted in the hope of a repeat of the good weather and sales figures of the past year. The acreage devoted to Honeydew, Galia, Cantaloupe and Piel de Sapo melons in Costa Rica is somewhat lower than last year's. Last weekend, the 25th edition of the Chinchilla Melon Festival was organized in Darling Downs, Queensland. During this edition of the festival, which is organized every two years, watermelons played a key role. The event attracts some 20,000 visitors to this small town, which is known as the 'melon capital' of Australia. This gives the sector a chance to promote the fruit. In recent years, growers in the region have faced various challenges. Part of the harvest was lost due to floods, hailstorms and drought. A grower told in local media that they needed two to three times more water to harvest 1,000 tons. Hort Innovation's most recent production figures (for the year ending in June 2017) point to a watermelon volume totaling 164,126 tons worth $ 96.4 million. Exports increased by 21%, to 6,116 tons worth $ 8.5 million. Nearly half of the exports (48%) were shipped to neighboring New Zealand. In China, the melon production seasons are evenly spread out, which is good for the market price, because not everything comes on the market at the same time. Melons from Myanmar, Hainan and Dhai are currently available on the Chinese market. The season in these areas kicks off in December and lasts until April. However, there was also a short halt in the supply of melons from Myanmar, because at the end of December, the border between China and Myanmar (Muse) was closed. As a result of this, the growers from Myanmar could no longer trade with the Chinese side, which entailed many consequences. In December, Myanmar's season reaches its peak, and at that time, trade wasn't possible, so many melons were lost and growers even gave them away for free at times. The border has been open again since the beginning of January. The melons from Shandong and Zhejiang hit the market in April and then remain available until the end of July. Melons from Jilin and Heilongjiang are available from October. The watermelons are currently very good; there is a lot of demand and afterwards, when it gets warmer, the demand also increases. Of all melon species, the price of the QiLin melon is currently the highest on the Chinese market. The situation is currently interesting in the watermelon market. Given the low price paid for maize last year as a result of the large harvest, growers in Free State and other places decided to plant watermelons this year to quickly earn money. This summer, these areas have had little rain, so many watermelon fields are dry. The entire harvest from the central parts of South Africa hit the market at the same time after Christmas, when rain reduced the impact of the heat wave. The holidays are a good time for watermelon sales. The supply starts in the north, after which the harvest moves to the central Bushveld in Limpopo. However, recent rains have caused the demand to shrink. There is a large volume available, but the high price per unit and the tough competition from other summer fruits slow sales down. The import market is currently somewhat tight in terms of volume, as a result of which importers have had to resort to other countries. According to a trader, the current situation is not special and is actually normal for this time of the year. Mexico has been supplying normal volumes, but since this week, Honduras and Guatemala have also started exporting to the US. The trader expects to see the volume rise. The supply from Mexico has been limited by a disease, and this, combined with the fact that the winter harvest is always lower than the summer one, has set the mood on the market. The demand in the US is strongly linked to the weather. The demand rises in warm weather. However, having a year-round supply is also important, because there are clients processing the melons. Due to the larger supply, the prices have been slightly under pressure. A price of 0.50 dollars/lbs (0.45 gr) was recorded a few weeks ago. Now the price oscillates between 0.25 and 0.30 dollars/lbs. The advantage of the larger supply and the lower price is that the demand will pick up.